The music is wonderful and gives the same mystical feeling as the other Castlevania titles. 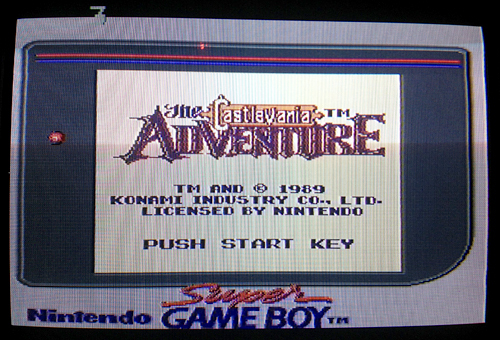 The graphics are ok for being Game Boy, and it resembles the first Castlevania game for NES a lot. You have the candle lights hanging in the air (though a bit odd that candle lights are floating in the air when you are outside in the forest among trees..) and the enemies are very Castlevania. Zombies are rising from the ground, but after first having dropped from the sky?.. maybe they are space zombies ^_^ And of course bats, but also birds, crows I think, which are extremely annoying and keep charging you from behind >.< There are also little fleamen that we are used to, however easier to kill than in other Castlevania games since they don’t jump around as much. One thing that totally baffled me though was that HEARTS give you HEALTH?! That is true in any other game, EXCEPT for the Castlevania series. We have grown to learn that hearts are collected to be used up when attacking with your special weapon, like the holy water, throwing dagger or cross. The CROSS btw makes you invincible for a few seconds, and as far as I played I didn’t bump into any special weapons at all! Why would they change all this?! Why?? Seriously the HEARTS give you HEALTH!!!! This entry was posted in Game Boy, Nintendo and tagged Castlevania, Game Boy, Health, Hearts, Nintendo, The Castlevania Adventures. Bookmark the permalink. ← Super Gameboy to Super NES!